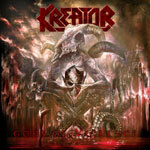 German thrash veterans Kreator entered a new era and established a slightly different musical identity somewhere from the Outcast record (1997) up to Violent Revolution (2001) and the latest coming Gods Of Violence follows this trace for the most part as well. Although I personally appreciate the band's earlier work too, there's no doubt to me, and to a lot of other fans to the band that I've talked with recently, that it's the records made on this side of the millennium change that have made this unit become even more popular. The classic, old material is usually what bands depend on heavily, but just by taking a quick look at which songs these guys choose to play at the live shows it's pretty obvious that Kreator is definitely closer to the opposite. Gods Of Violence thus at large comprises typical contemporary Kreator thrash metal with both aggression and melody in the songs, even if it's perhaps just a tad more brutal over the record in comparison to the most recent albums in the band's catalogue. To put a mean side to my judgment, this record is actually just some more of kind of the same stuff, but since it's also really awesome for the most part I think it validates the choice of continuing a recognizable formula. To set the record straight, I will also mention that I now and then hear bits and pieces similar to what was released on the early recordings up to Extreme Aggression (1989) too. Maybe not so much, but sometimes I am able to locate both shorter and some extended parts that are familiar in some way to the old stuff, really. The intro Apocalypticon sets the tone for the whole record as it builds up an evocative atmosphere right off the bat and along the ride I'm continuously hit with things that go directly into my book of approval. The guitar hooks and leads that this outfit have developed during the second half of their career are hugely important to build everything into an entity and without hesitation those attributes are the greatest part of the reason to the band's second coming in the 2000's. The result of being able to bring forth melody on top of an assaulting background is quite astounding and I even played half of the brutal song Totalitarian Terror for a guy that I know, who usually hates everything about metal music, and I told him to listen to it just once and his answer really confirms this whole thing by saying "I hate the song and the vocals, but the guitar things are fantastic.". Mille Petrozza's voice is pretty much the same as always and he seems to be just as pissed off as ever. His voice never had the most amazing tone of them all or was the most skilled one technically of course, but it's of great character and very fitting to the style of the music. The drum play from Ventor is highly identifiable, with his way of letting the drumbeats mostly sound pretty sudden and short-lived, and is utterly a feature of the Kreator brand that probably won't ever change significantly. It takes no genius by now to figure out that I think that this is a really good thrash metal experience and if you already dig the last couple of albums I'm quite certain that you will enjoy the music on Gods Of Violence too.